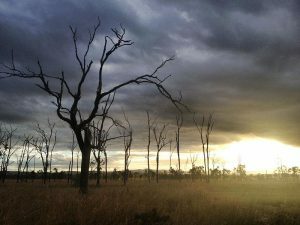 A hybrid microgrid will be constructed in the Australian Outback where conditions are harsh. Source: Wikimedia Commons by Artsoceans. Construction will begin in September on a hybrid microgrid in Coober Pedy, a remote town in the Australian outback where conditions are harsh. Two Senvion MM92 turbines will supply wind energy to the hybrid microgrid, which also will use solar and battery storage to help the community reduce its reliance on diesel fuel. The project has secured $18.4 million in funding support from the Australian Renewable Energy Agency (ARENA). Commercial operations are expected to commence in the second half of 2017. Solar Impulse, a plane that is essentially a flying microgrid, completed its round-the-world flight using only energy from the sun — no fossil fuels. During its flight, Solar Impulse had to confront many of the challenges that its partner ABB is solving on the ground for its customers: maximizing the power yield from solar cells, integrating renewable energy into the electricity distribution systems and improving energy efficiency (in the case of Solar Impulse, to keep the plane aloft at night). The plane made stopovers on four continents (Asia, North America, Europe and Africa) and flew across two oceans (the Pacific and the Atlantic), as well as the Mediterranean Sea and the Arabian Peninsula. It set several new aviation records, including that of the longest solo duration for an airplane and the first crossing of the Atlantic Ocean in a solar airplane. Click here for more on the historic flight. Distributed energy generation is on the verge of disrupting the power sector, according to Lux Research; the key to the future is technologies like the Internet of Things, big data and renewables. Unlike the distant fuel-burning plants of the traditional power industry, distributed energy generates and stores power much closer to the end users, often using newer technologies such as solar and batteries. “Much of the challenge and opportunity lies in software for controlling, optimizing, and integrating DG, and while IT companies like Google, IBM, and Cisco have yet to make a serious mark, they’re particularly well-positioned to solve these problems and should take advantage of big opportunities in the future,” she added. Lux Research analysts also found that among DG players, partnerships are key and IT companies have a large role to play in the grid of the future. In South Asia, the Asian Development Bank (ADB) approved a loan of $115 million and $3.8 million in grants to help Sri Lanka meet its goal of achieving 100 percent electrification and improve the reliability of its electricity supply, including in former strife-torn areas and on small isolated islands. A hybrid microgrid will be installed on one such island in the Western Province. The project includes a microgrid pilot scheme, financed by the Clean Energy Fund, which will demonstrate cost-effective management of power resources and reduce the burden on the national grid. It is the first time this concept is being trialed in Sri Lanka. “Sri Lanka’s national electrification rate has gone from 29 percent to 98 percent in the space of 25 years, but some areas particularly in former conflict-affected zones and on small isolated islands still struggle with an unreliable power supply,” said Mukhtor Khamudkhanov, an ADB principal energy specialist. The project will help meet the needs of areas that have been missing out through upgrades to the medium voltage network, the rollout of over 2,300 kilometers of low voltage line extensions, and the construction of hybrid renewable energy mini-grids, according to Khamudkhanov. Three isolated island communities in the Jaffna area of the Northern Province will have a reliable electricity supply from hybrid microgrids that use a combination of wind, solar and efficient diesel generation, along with the installation of energy-storing long life lithium-ion batteries. The grants for the project comprise $2 million from the Japan Fund for Poverty Reduction and $1.8 million from the Clean Energy Fund under the Clean Energy Financing Partnership Facility, a multi-donor facility administered by ADB. The project, expected to be completed in September 2021, will help deliver reliable electricity to move than 35,700 rural households. And in Nepal, a collaboration between leading mobile service provider Ncell and Gham Power aims to provide both access to energy and mobile connectivity to rural, off-grid communities. Ncell will take anchor load of solar power generated by three Gham Power microgrids in Okhaldhunga and Khotang district, making its off-grid systems commercially viable. The three microgrids generate 35 KW of solar power, enough to power the two Ncell mobile tower sites and to distribute surplus energy to community businesses and households. Before this mutually beneficial collaboration, Ncell had been expanding its service areas to off-grid areas by building its own solar power. As of now, 5.77 percent of Ncell sites operate solely on solar, and an additional 8.5 percent have solar back-up sites with hybrid solutions. The solar microgrids are built by Gham Power with financial support from Asian Development Bank Energy for All Program, other technical and financial assistance from the DOEN Foundation and NMB Bank in collaboration with Alternative Energy Promotion Centre. GSM Association, in its bid to support installation of microgrids to provide energy to mobile towers, household and businesses, had also provided the “Mobile for Development (M4D) Utilities Innovations Grant” to Gham Power as seed money last year. 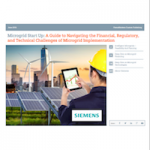 Track news about hybrid microgrids and other microgrid projects worldwide. Join us on twitter @MicrogridNews.